Dry needling isn’t a new technique, however over the past few years is has started to gain traction within the physiotherapy community. More practitioners now use it to assist with the rehabilitation of their clients. I personally have been doing dry-needling for about 5 years and have really found it a great adjunct to many conditions patients present with. There is still a lot of unknown about dry needling and its connection with acupuncture and this article will hopefully help give you a better understanding of the similarities and differences. Dry needling is a technique that uses small filament needles (exactly the same as acupuncture) to help release trigger points to relieve pain and/or increase range of movement. It has shown to have a positive effect on injury recovery in patients by increasing their muscle function. Continuing to operate with poor or restricted muscle function has the potential to lead to further damage or inflammation. The reasons for dry needling being effective are not fully known, however with increasing scientific support there has been research showing dry needling to have a positive effect on the electrical and chemical communications that take place in our central nervous system. This can include inhibiting the “pain response” which can have obvious benefits within the recovery from injury. What is the difference between dry needling (what we offer) and acupuncture? There are a lot of similarities between acupuncture and dry needling as the needles used are identical. The main difference however is dry needling is based on a western anatomical and neurophysiological approach, whereas acupuncture uses Traditional Chinese Medicine (TCM). TCM is based on pulses, coatings and meridians from ancient Chinese philosophy with needles inserted into defined acupoints, intended to unblock the energy meridians and restore the balance within the whole body. Dry needling uses current medical research and the placement of the needles doesn’t always match up with acupoints. Whatever the theory, the positive affect on pain relief reported is generally consistent. This is whether treatment is administered as part of dry needling or acupuncture. When first inserting the needle there may be a small pinch or prick, however a lot of the time the needle is not even felt on insertion. A local twitch response or slight contraction of the muscle is what will be felt for most needles and this may provoke a sudden but brief pain response. Gaining this “twitch” response is a desirable reaction as it normally results in the patient reporting a positive therapeutic response. Treatment will differ for everyone, with some patients feeling relaxed and others experiencing heaviness in the limbs or a generalised ache. Muscle soreness is a common symptom and may be felt for 24-48hours post treatment. The physiotherapist providing this treatment option will check in regularly with the patient to ensure that the treatment response is normal and you are not in too much discomfort. Dry needling is a very safe technique. All the needles are single use and individually packaged sterile needles. Physiotherapists follow strict hygiene procedures and techniques to ensure the needles remain sterile prior to being inserted. The needles are very fine (.13 – .30mm) and will rarely cause bleeding or bruising. We like to use dry needling as an adjunct to many treatment options. My personal treatment preference as a practitioner is a very “hands-on” or manual approach and this is an ideal that Peter (my colleague at the practice) shares. We find this provides the best results for patients. We use dry needling as an addition to this style of treatment. Does it cost any extra? Absolutely not! If dry needling is performed as part of your treatment then it is all covered under our standard pricing. However, we do recommend that you leave up to 45 minutes for your treatment instead of the standard 30 minutes while we let the needles have their prolonged effect. For further information about dry needling please feel free to email me [ben@northwestphysio.com.au] or ask Peter or myself at your next appointment. 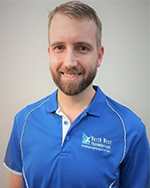 Ben Dansie is the Principal Physiotherapist at North West Physiotherapy Eatons Hill. Ben practices all of the core physiotherapy treatments with further training in; western acupuncture, dry needling, shoulder rehabilitation and hip/sacroiliac dysfunction.